If your baby has died before birth, you will have overwhelming decisions to make about how you would like to spend time with your baby before you have to say goodbye. We have spent lots of time talking to other bereaved parents, who have helped us put together some thoughts on the ways you can create precious memories with your baby. Please remember that creating memories with your child is an incredibly personal experience, and what is right for one person may not be right for another. Take your time and do what feels right for you and your baby. If you have found this page after your baby’s death, you may be regretful at not having done some of the things we have suggested for parents to do with their baby. Most parents do not get time to prepare themselves for saying goodbye to their child, and have to rely on hospital staff to guide them through spending time with their baby and taking photographs to create memories. If you feel that the hospital did not support you to create memories or take photographs, you may wish to show them this page to suggest how they can improve the way they support other parents when a baby dies. * You may be unsure whether you want photographs taking or not, but it is worth bearing in mind that you sadly only have one opportunity to take them. If you decide to take photographs (or have a member of staff/family member/friend take them for you), you do not have to keep them or look at them, but if you do not take any you will not have the chance to take them again. The best advice we can give you is to have them taken, and you can decide what to do with them later. * Most hospitals are able to take photographs for you and you are of course able to take them yourself, or you could ask a trusted family member or friend to take them for you. Photographs of your baby with and without clothing. Photographs of your baby in a special outfit. Photographs of your baby wrapped in a special blanket, which you may wish to keep. Photographs of your baby’s hands and feet. Photographs of you holding your baby. Photographs of you and your significant other holding your baby. If your baby has any siblings, you may wish to have photographs of them holding your baby so you have captured the moment all your children were together. Photographs of family members holding your baby. Photographs of your baby holding special jewellery, such as your wedding rings or a special necklace. Photograph you holding your baby’s hands/feet. If you have other children, you may wish to give each of them a disposable camera (or depending on their age, let them use yours) to take their own photographs of their brother and sister. Later, you can help them to create their own scrapbook of their photographs, in memory of their sibling. * Remember My Baby, the UK charity which offers the gift of baby remembrance photography to bereaved parents, is now available at some hospitals and hospices in the UK (including Airedale General Hospital). Remember My Baby services are available to families who experience the loss of their baby before, during or shortly after birth. Remember My Baby can be contacted by parents/families, or by hospital staff. A professional photographer will visit and spend time with families, to capture their precious time with their little one. Parents then receive a USB of beautiful black and white photographs of their baby 4-6 weeks after the photography session. The benefit of having professional photographs taken is that a trained photographer understands the importance of lighting and is able to take tasteful photographs which you will cherish for a lifetime. The local Remember My Baby volunteer for Airedale General Hospital and the surrounding areas is Laura Sunderland, who can be contacted on 07905179128. * Spend time bathing your baby and changing his or her nappy. Take photographs and even videos of you spending this precious time together. You could also keep a nappy out of the same pack of nappies that you used, as a reminder of the nappies your baby wore. Use a special baby lotion and/or baby wash when you bath your baby, the scent will later remind you of him or her. * Wrap your baby in a blanket, which you can keep to take home. If you keep the blanket in a sealed plastic bag, it can keep the smell of your baby for longer. * Read a story to your baby. You may have already bought books, or you could buy a special one to read. The book will become a precious keepsake which will remind you of your baby. If you plan on having more children in the future, you will be able to read the story to them and tell them that it is their sibling’s special book. * You may have favourite nursery rhymes, children’s songs or special pieces of music which you had dreamed of singing to your baby. Take the opportunity to sing or play them to your baby now. The music will always remind you of your baby and you could choose to play it at his or her funeral service and/or memorial service. * The hospital should be able to give you the option of staying overnight (for one or possibly more nights) with your baby, if you wish to, in a room together. Ask your midwife or other member of hospital staff about whether you can do this. Airedale General Hospital has a dedicated room called The Sunbeam Suite, where bereaved parents are able to stay with their baby. * Many of the parents we have spoken to did not realise that they were allowed to take their baby out of the hospital, and wish they had known that this was something they could do. Some parents decide to take their baby home, or to take them to a special place. You are legally allowed to do this, except in rare cases where a coroner has ordered a postmortem. * If you would like to take your baby out of the hospital, let a midwife or member of staff at the hospital know. They will be able to provide you with information about keeping your baby as cool as possible, and tell you when you will need to bring your baby back to the hospital. If you are arranging a funeral for your baby yourself, you are allowed to keep your baby at home until then. Please ask the hospital staff or your funeral director for advice about this, you will need to know how to keep your baby as cool as possible at home and for how long you are able to do this. Your hospital will be able to give you a form which confirms your legal right to take your baby’s body out of hospital. In the unlikely event that your hospital staff are unable to provide you with a form, they can download a basic form here (available soon), which can be signed by a member of staff at the hospital. You do not legally need to have a form to be able to take your baby out of hospital, but having one may help to avoid any difficulties. * Bear in mind that if you have decided to have a postmortem, you will need to take your baby back to the hospital fairly quickly as it is likely to provide more information if it is done as soon after death as possible. * Cut a lock of your baby’s hair. Keep it sealed in a small bag, you could later have it framed or have it put into a special piece of jewellery. * Take your baby’s hand and footprints. Most hospitals now stock Memory Boxes like ours, which contain items such as ink-less wipes and clay hand/footprint kits, allowing you to capture imprints of your baby’s tiny hands and feet. * Take prints of your baby’s hands, along with prints of your own hands and place them side by side, or in a ‘wheel’ (circle) shape. Circles are known to symbolise infinity, and creating your family’s handprints in a wheel will symbolise the everlasting love you have for your baby as an important part of your family. * Buy or make a cloth teddy bear (this may not work on a ‘fur’ teddy bear), and put your baby’s inked hand/footprints onto the bear’s paws. Take photographs of your baby with the bear, to create memories of your baby’s size compared to the bear. The bear will make a beautiful keepsake and give you something to hold that has a part of your baby printed onto it. * Make lip prints by using a pale coloured matte lipstick, applied to your baby’s lips and pressed to a piece of paper. You will need to keep the prints in a small plastic bag to stop them getting smudged before you have time to get them framed. * Keep your baby’s hospital bracelets (and your hospital bracelet too). * Keep an outfit that you dressed your baby in. If you keep it in a sealed plastic bag, it can keep the smell of your baby for longer. * Give your baby a cuddly toy, which you can leave with your baby or take home so that you have something of your baby’s to hold. If you are buying a new cuddly toy for your baby, you may like to buy two that are identical – so you can leave one with your baby and take one home to remind you of him or her. 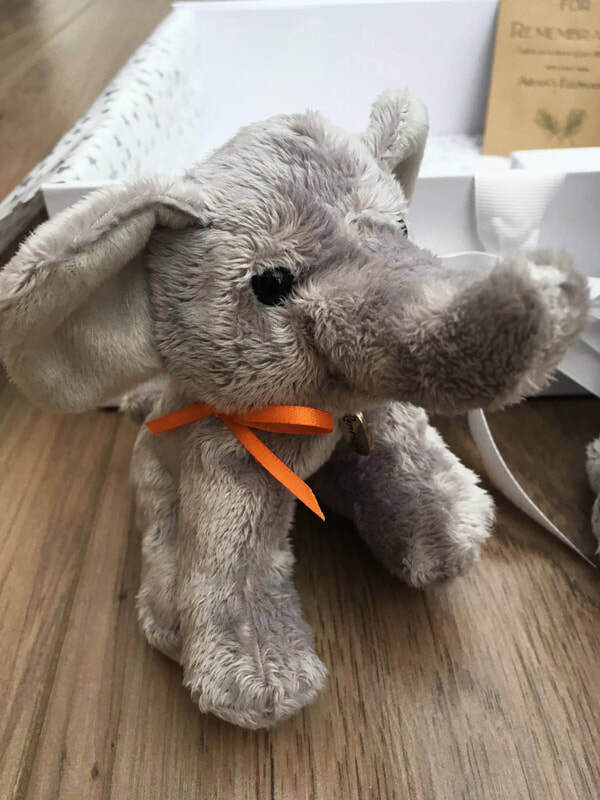 All our Memory Boxes contain two identical 'Aidan's Elephants' - one for the family to keep, and one for them to give to their baby. Is there something you did with your baby which you would like to tell other parents about, so they can consider whether they would like to do the same with their baby? Is there something you really wish you had done or wish you had known you were allowed to do? Please get in touch with us.